Unai Emery has paid tribute to Petr Cech after the veteran keeper announced his decision to retire at the end of the season. Having left an indelible mark on the European game, tributes to the 36-year-old have poured in from across the football world in the last 48 hours. Like his peers, Emery agrees the veteran deserves respect for a career that has seen him win 18 major honours since making his first team debut in Czech football 20 years ago. “I think he’s a very big person,” Emery told press ahead of Arsenal’s game with Cech’s former club Chelsea. “As a person I’ve only known him six months. After that, I know him like a player. It’s unclear whether Arsenal would have offered Cech a contract extension when his current deal ends in the summer, either way, the boss says he firmly respects the player’s to walk away while at the top. “His decision is a very, very personal decision and I respect him,” said Emery. 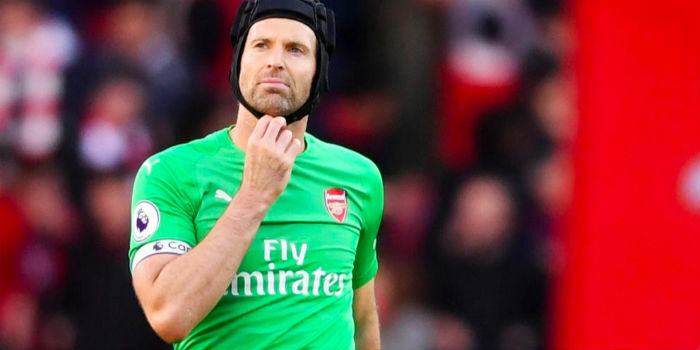 Having fallen behind Bernd Leno in the keeper pecking order at the Emirates, Cech looks likely to spend his final months playing the cup competitions. How great it would be for him to sign off with another cup, possibly even a European title. A bit like Jens, I’d like to see Cech move into a non-goalkeeping coaching role one day. I get the impression he has a lot to give and hope he doesn’t get pigeon holed into a goalkeeping coach role just because he was a keeper. Unfortunately it seems Chelsea are offering him a coaching position, with total radio silence from our side (at least in the media). So I guess he’ll end up going there – possibly to work with his old coach Lollichon, one of the best in the business. Can’t blame him – although of course I wish we’d retain his services rather than those cunts in blue. Instead of a testimonial, how about a triple threat match between Cech, Mad Jen’s and Gerry Peyton? Anyone? Cech has always been a pro at Arsenal, even if he wasn’t quite as his top level, which is a very high standard indeed. I’ll miss seeing him at the back. P.S. Emery loves his ‘moments’ doesn’t he? We will have to find the keeper of good quality to come in to compete with Leno. Clearly Ospina isn’t it. Whether Emery feels Martinez can step up is also a good question. Otherwise it may have to be from market adding another player to the list we need to free up money for. An alternative I would have thought would be to keep Cech for another season being he is still only 36yrs. We will free up some money in the summer. Koscielny (100K), Cech (100K), Lichsteiner(90K), Welbeck (90K) not to mention Elneny (55k), and of course dead wood like Jenkinson, Lucas Perez and Ospina. So that’s a substantial amount of wages freed up. But if we don’t do anything now we will need to add a new keeper, a Cback, CM, and RW, potentially a young striker. if there are still question marks on Nketiah. What we can do this window will be helpful. Ramsey looks like he will leave on a free at 300K a week now reported by the Times, there is no way we will retain him. But he may be retained till end of season. Where we can find some elasticity now to bring in a player in Jan is the question. Elneny is a potential loan to Roma which frees up 55K but that isn’t substantial enough. Ozil – finding a buyer for his wage demand seems tough this window. Of all positions at the moment, we could certainly do with a winger like Carrasco to inject some sort of imagination and belief back into the attacking side of things, particularly with issues with Ramsey and Ozil in terms of long term commitments. One alternative as I mentioned is to put Mhkitaryan (120K) up for sale as well but that may now risk stability even more (with both Ozil and Ramsey uncertain) and considering a distinct lack of resource in attacking end of midfield. We could flog off Lichsteiner (90K) early since AMN can cover Bellerin but again unlikely to find a buyer. Bit harsh on Jenks there. Life long servant of the club and a real Arsenal lad. Will be sad to see him go, and frankly we could have done with him sticking around so we didn’t need to replace him. Maybe Matt Macey it’s doing enough in Plymouth to be considered as back up next year. Chavski reject. Never good enough. How many penalty saves in how many seasons? Nowhere near the level of lehman or seaman. We got him when he was past best. Not his fault he was never the same after head injury.